Amid 1000 useful apps that roams the app world there are some exceptions. Sometimes exceptions are good, only sometimes. Vignesh Radhakrishnan brings a sample of such exceptions from the huge world of web apps for you. Amid the innumerable useful applications that roam the app world, there are some exceptions. These exceptions are good sometimes, only sometimes. Let's take a look at some of these in the wide world of web apps. All you have to do is type yours and your dream partner's name in the text boxes and like a tarot reader it predicts whether the relationship would work out or not. How exactly it comes to a conclusion... no one knows! After all, love is blind. Isn't it? I tried my name with Salma Hayek's... here's what the app said: "A relationship might work out but the chance is very small. A successful relationship is possible but you both have to work on it". Well, I wish the app also gave her personal e-mail so I could forward this to her and ask her out for a date. 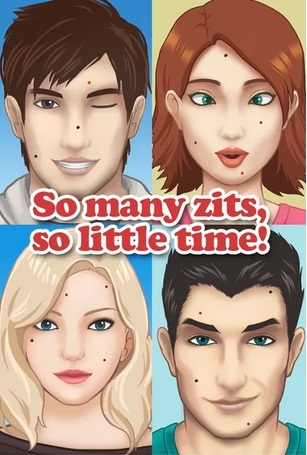 Yes, as the name suggests, it is a pimple popping app. When the user starts the application, a beautiful girl/handsome boy's face, filled with pimples, appears on the screen. And, all that one has to do is to pop the pimples. YUCK! Enough said, enjoy the video. 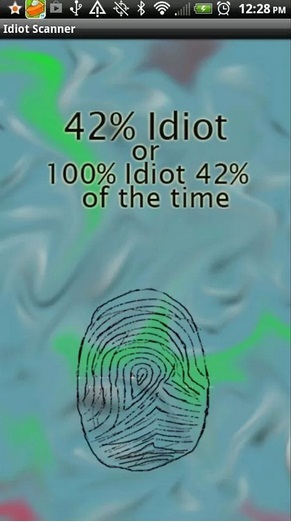 Here's an application that can scan idiots, and all it needs are finger prints! If only my mathematics teacher had this app, he would have thrown me out of the class the very first day. Poor guy found out only after my results, a year later. Be careful while using the app to fool your friends, it could backfire. The sleeping history of humans is filled with bloody battles with this six legged needle-nosed bug called a 'mosquito'. Men and women have literally lost sleep in finding ways to stop their menace. They've tried all tricks in the book to keep them away, rather unsuccessfully. I remember using small 4*4 blue colour 'mats' to keep mosquitoes away. Then, we upgraded to coils that left ashes scattered all over the floor, every morning. And then, we went hi-tech with liquids. However, after a while, nothing seems to work! The latest trick in the book is an android app: "Anti Mosquito - Sonic Repeller". 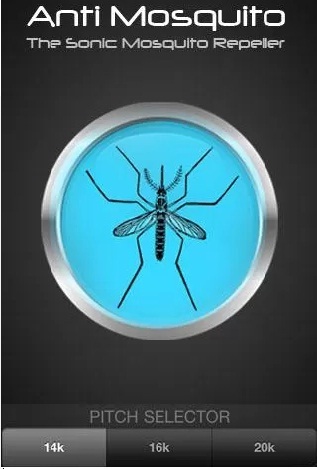 According to developers, this app helps repel mosquitoes and some other nasty bugs too. The application emits a unique high frequency sound (ultra sound) that these insects dislike. The pitch of the sound is so high that most humans might not even hear it. I guess it's just a matter of time before mosquitoes will get used to this too! • Researchers have developed a new app and cradle that can together turn a smart phone into a handheld biosensor which can detect toxins and bacteria, spot water contamination and identify allergens in food. Developed in the University of Illinois, Urbana-Champaign, the app and cradle use a phone's built-in camera and processing power as a biosensor. • Researchers in Pakistan have developed a smart phone app that keeps track of one's location and distance walked from home or hotel. It warns users when they're likely to be caught out after nightfall. It's been developed especially for those suffering from night blindness. The app can also help troubled travellers find hotels, should they find themselves too far from base to get back safely.